Sometimes lazy writing involves using more words than needed. Characters give a sigh or give a wink instead of just sighing or winking. They make their way somewhere instead of walking, driving, climbing, wending, etc. They have a feeling of dread about something instead of dreading it, or haven’t seen someone for a while instead of for hours, days, weeks, months, or years. Readers soon get tired of such lazy usage and yearn for some brevity and specificity. The same effect occurs with over-creativity, by which I mean referring to a character in too many ways. Joe might be a short guy with black hair who is also a police officer in Chicago. As paragraphs about his action go by, he’s referred to as Joe, the short man, the black-haired fighter, the cop, and the Chicagoan. In trying to avoid repetition, the author ends up confusing the reader by introducing too many variables. This tends to happen in action novels, where a character is lightly sketched at first appearance and never developed to the point of being easily recognizable later. Such variability again makes the reader have to work hard to keep track of who’s who. The most common lazy writing I encounter is false suspense, although this is a result less of laziness than ignorance. It usually occurs in a first novel, when the author doesn’t yet understand the difference between suspense that generates the “What happens next?” question and suspense that generates the “What’s going on?” question. I recently challenged a client about why he kept starting new chapters in new places and times without telling us who was talking or where/when they were. That information came several paragraphs or even pages into the chapter. He said he liked dropping readers straight into the action. That’s fine if readers can follow the logic leap. If not, it’s a head-scratcher that is certain to leave readers impatient and confused. Lazy writing occurs also in matters of verisimilitude. When writers get carried away with the excitement of their story and don’t later verify facts and logistics, it falls on the editor to burst their balloon by pointing out that a scene can’t happen the way it’s described. Most such bloopers are easy fixes, such as adjusting the scene to account for moonlight (or lack of), or whether it’s possible to maneuver with bodies lying around underfoot, or how a specified gun type might behave, or accounting for vehicles left crashed in the middle of the road when the hero then zooms down said road unimpeded. Sometimes a technical blooper might require a major recast of scene or even storyline; but, thankfully for both writers and editors, bloopers usually are of the “duh” type, such as cigarettes lit but never put out (or smoked in 30 seconds or 30 minutes), or the consequences of a major wound (people who don’t bleed, or continue running around when they’ve had a lung shot out), and the like. Fixing those items doesn’t require revising the whole book. The laziest of lazy writing, in my passionate opinion, is the cliffhanger, be it the ending of a scene, a chapter, or an entire book. I acknowledge that this can be a matter of taste, and I struggle with determining whether that’s truly the case or if the story is hurting itself by using that device. How to respond to cliffhangers is, perhaps, the most difficult decision I must make as an editor. Do I let it go, or flag it as a criticism or item for discussion? As a recreational reader on my own time, cliffhangers inspire me to simply toss a book over my shoulder, but as a professional editor, I can’t do that. Cliffhangers strike me as a cheap shot, as manipulative, as author intrusion into a story. They occur most often in series novels, used as an attempt to bribe readers into reading the next book. I consider cliffhanging a lazy technique because, as a reader, I want resolution. I am willing to keep turning pages if the author keeps the suspense and interest mounting, but I don’t need to be compelled to continue by force. I want closure of the individual volume’s story with promise of more to come, not major components left dangling to provoke me into reading the next book. As with almost everything relating to writing and editing novels, subjectivity is a big factor. My job as an editor is to inform an author about any spot where other readers might bark their shins. It’s up to the author to decide whether those places are things they want to think about and change. If the author chooses to let an issue stand, I’m fine with that. I care only that they make an informed choice. The marketplace will decide whether it’s the right choice. Most of us know that you can’t please everyone, and the author’s goal is to connect with the audience who wants to read their stuff. My job as an editor is to help them achieve that end. It’s a rare editor who doesn’t encounter lazy writing during their career. Those who work with indie authors, especially new ones, encounter it often. Tolerance for editing lazy writing should be considered when deciding what kind of editorial work to do for a living. That tolerance level also an important component of structuring contracts — defining exactly what the editor is going to do to the client’s manuscript is essential to a good working relationship. If you have the heart and soul of a developmental editor, and you find clients willing to pay the cost, then you can dive into someone’s early work and help them avoid symptoms of lazy writing. This not only gives you job satisfaction, but also helps line and copy editors down the road, who might not be developmentally inclined and have a harder time sorting out the material, defining the boundaries of their work, and helping their clients. Line and copy editors do sometimes have to deal with un-developmentally-edited texts, because their clients are unwilling or unable to pay for the higher level of edit that would catch and help the author fix instances of lazy writing. In all cases, no matter what level of editing is involved, editors have to define terms and expectations carefully in the work they propose to provide. Copy editors are generally limited to making comments and queries instead of rephrasing, and both editor and author might end up tearing their hair out if the “edited” manuscript is overloaded with changes and queries attacking the text when that’s not part of the agreed-upon scope of work. A client expecting the mechanical focus of copyediting might not be open to the heavy hits on their prose by an editor who recognizes lazy writing and tries to improve it, while a client expecting deep involvement in their prose might feel cheated if all they get are mechanical edits. Over the years, I’ve come to appreciate lazy writing. It forces me to concentrate on a story and think hard about the details, get engrossed in the characters, take the author seriously. Addressing the questions that lazy writing triggers and talking with the author about them brings out the best of our relationship, letting us blend the artistic and analytical elements that bring out the best of the work. Ultimately, we all — author, editor, and the story itself — end up more muscular and vibrant. How can that not result in a better book? Many of us write lazily when composing our letters, reports, and books. It’s easier to turn ideas into words when we’re relaxed and nothing inhibits the flow. Creative writing, especially, benefits from the author “letting ’er rip.” That liquid, unstriving state of mind best releases the emotions and imagery needed for a story, but to bring that story to fulfillment through publishing requires being balanced by a disciplined state of mind to finish the job. Laziness in writing, therefore, has both a positive and negative aspect. The positive aspect of laziness is a glowing, happy state, such as what accompanies a Sunday afternoon with no obligations, when one can kick back and enjoy a rare opportunity to read, walk, talk, travel, party, eat — whatever brings satisfaction, allowing one to be at ease. In positive laziness, thoughts can flow in an absence of tension. As it pertains to writing, a certain amount of psychic laziness brings inspiration, productivity, and joy. The negative aspect of laziness is unwillingness to do what has to be done. There might be good reasons for it in someone’s personal situation, but laziness and the oft-resultant procrastination rarely combine into a happy outcome when writing a book that the author desires to publish. Negative laziness in writing translates into “not enough thought or revision,” resulting in a work that’s put out into the world unpolished. In most cases, a lazily written book will not be acquired by an agent or editor (in traditional publishing). If a lazy novel is self-published, readers won’t buy it or finish it or recommend it to their friends. Worse, they will give it bad reviews. It’s normal for an author to be unable to self-revise and eliminate the symptoms of negative lazy writing. Revising and polishing one’s work can be like looking in a mirror: You know what you’re going to see, and that image of yourself is imprinted in your mind, making it hard to see anything else. A similar self-blindness occurs in reading one’s own writing. It’s tremendously hard to view it through someone else’s eyes — which is why authors use beta readers and hire editors. This essay, then, is aimed more at editors than writers, although both can benefit from knowing what symptoms to watch for. In the novels I edit, positive laziness shows itself in zesty, imaginative plots and colorful characters, while negative laziness shows itself in flat characters and dull, redundant, and/or unclear prose. This negative quality I dub “lazy prose” because it gives the impression of incompleteness, as if the sentences were written without planning or examination. That usually occurs in the first or second draft, when the author is still mapping out the story and perhaps struggling to flesh it out. At that point, there’s no negative laziness involved. But if no effort follows to refine the text, then I mentally flag the book as lazy. There’s also a version of lazy prose that reflects egotism. Sometimes authors believe that all they have to do is type out their thoughts, and every reader will share their vision and understand all their characters’ motivations, actions, and emotions. Unfortunately, more often than not, the information a reader needs to enjoy this sharing and understanding isn’t in the manuscript. Here are some examples of how lazy prose leaves a book unpolished. The most common lazy word I see is large. I’m tempted to call that word the universal adjective because it crops up so often! For instance: A large man enters a large building through a large door into a large room with a large fireplace. Or, a large army is led by a large man on a large horse wielding a large sword. Okay, I exaggerate: I’ve never seen large used more than twice in one sentence, but I have seen it used 10 times in one chapter and several dozen times in one novel. It’s a perfectly good adjective, but when it becomes the author’s pet descriptor throughout a story, and I’m trying to form mental images as I follow the characters through their adventures, then the word’s inadequacy becomes apparent. In the author’s mind, a large man might be a tall one, a fat one, or a big hairy one. In the reader’s mind, without any other information, it’s hard to visualize the person if all we’re given is large. Let’s say the author introduces a character as a menace to the protagonist, such as when a sleuth is confronted by an enforcer for the criminal he’s tracking down. Just saying the enforcer is large draws no picture, and the threat intended by this person’s appearance fails to impress. Expanding the description to draw a more-precise picture requires adding words (e.g., built like a bull with no neck), which might be problematic in action stories or scenes where spareness keeps the pace moving. In such cases, a single adjective must serve. Just upticking large to beefy improves the image. A thesaurus adds options: stout, heavy, thickset, stocky, chunky, brawny, husky, burly, strapping, hulking, elephantine, herculean, humongous — at least 10 others. Usually a brief elaboration, such as an enforcer built like a bull, or a door twice as tall as a man, will do the job. It can be argued that twice as tall as a man is just as vague as large, because man isn’t defined; however, most people have an idea of the general size of adult male humans, so describing something as twice that size has more meaning than just large. One of my clients, in response to my requests to be more specific when he repeatedly used large, said he wanted to leave the reader free to visualize the person/place/thing in their own way. That’s a fair position, and in many genres an appropriate style. I share this author’s (and many others’) dislike of too much description and will always encourage lean prose over verbose prose. At the same time, I believe it’s possible to omit too much information and leave readers struggling to follow the story or understand the characters. I’ll second that, and add that one precise adjective can draw a sharper, more-evocative picture than a vague one like large. Editor’s note: Part 2 will be posted on March 15. I do a lot of writing, and over the years I’ve investigated many a tool that’s supposed to help with that process. The most prominent of these, of course, is the bloated but powerful Microsoft Word. With my various add-ins at the Editorium, it can be a terrific editing tool. But for writing, something else is needed. Why? Because (as with most word processors) writing in Word is like scribbling on a scroll. Access to text is sequential rather than random (as I explained in my essay, “Changing Formats: From Scroll to Codex to eBooks”, although if you’ve used Word’s built-in heading styles, it’s possible to jump to those headings using the navigation window. Rather than scrolling (or jumping) around a long, long document, I prefer to write in bits and pieces and then combine selected bits and pieces into a single document ready for editing. It’s possible to do this (kind of) in Scrivener using its “corkboard” feature (on both Mac and PC). Unfortunately, like Word, Scrivener strikes me as clunky, uncooperative, and overly complex. The top part of the screen consists of boxes divided among rows and columns. Each box represents a separate document (although all of the documents are in the same file). We can move the cursor to the box we want to use and press ENTER. The cursor jumps to the document at the bottom, and we’re ready to write. To return to the boxes, we hit the ESCAPE key. 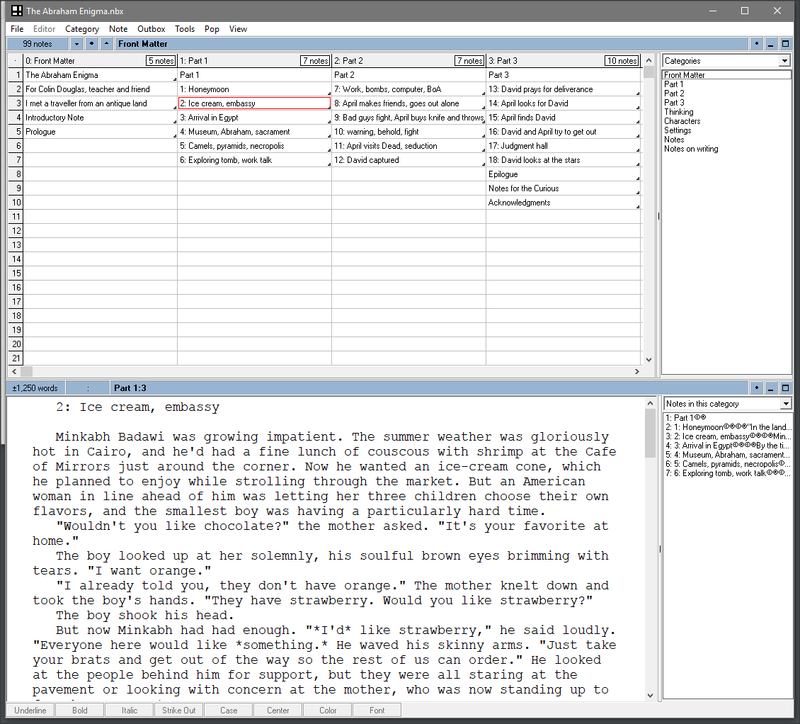 With Notebox Disorganizer, we can see the entire structure of our book laid out in a grid. Here, the book is broken up into parts that include the various chapters, but we could just as easily have each column be a chapter, and the boxes in that column be scenes. For nonfiction, each column could be a chapter, and the boxes could be sections of the chapter. We can move boxes and columns around as needed. If we realize that scene 4 in chapter 2 should really be in chapter 8, we can cut the box and then paste it where it belongs. If we see that scene 4 should actually be scene 5, we can move it down. The program offers lots of flexibility. If you’d like to see the Notebox Disorganizer file in which I wrote this article, you can download it from the Editorium’s website. Change Notebox Disorganizer’s preferences (under Tools > Set Preferences > Misc > Forbid Formatted Text) so that it uses plain text only — no formatting allowed. Use Markdown syntax to specify (rather than apply) formatting — for example, use *asterisks* to indicate italic. Heading levels are specified with cross-hatches: # Heading 1, ## Heading 2, ### Heading 3, and so on. A complete reference for Markdown syntax (which is intuitive, human readable, and platform and program agnostic) is available as a downloadable PDF or online from GitHub. If there are certain boxes we don’t want to include (research notes, for example), we just don’t include them in the outbox. After we’ve finished with our selection, we click File > Export the Outbox and give the document a name. Under “Files of type,” we select “Text.” Then we click OK, and the text is exported as a single text file, with Markup codes intact. Download and install Typora. (Typora, too, works on Mac, Windows, or Linux. Click the little arrow at the bottom of the home page; then click Download on the upper right.) Typora is an editing and rendering program for Markdown. Have you finished installing? Great, then download from the Editorium website the Markdown document I created after writing this article. Put it on your desktop and then double-click it to open it in Typora. Beautiful, no? Nice formatting and proper document structure. Just for fun, try some of the alternative CSS themes (click Theme) — or open the file in a plain old text editor to see the Markdown codes. You can actually use Typora on its own to write just about anything (note the document outline on the left). As soon as you type something (using Markdown syntax), Typora renders it into an appropriate format. But we need a Word document, right? Well, one of the beautiful things about Typora is that it works automatically with Pandoc, so we can easily export our document as a Word file. To see this in action, click File > Export > Word (.docx). Now open the Word file (same folder and name as your Markdown document) and marvel at the result — a nicely formatted and structured document that any editor would be pleased to work on and any designer would be happy to import into InDesign. Please take a moment to contemplate how revolutionary that actually is. Authors and Styles and Fonts, Oh My! As you’ve seen, editors can easily convert a Markdown document into a Word document for editing, with all of Word’s tools at their disposal. The Markdown codes will be appropriately converted into Microsoft Word paragraph styles, with no extraneous formatting or messed-up footnotes to be cleaned up. Wouldn’t that be nice! They can’t just as easily work in Word. In fact, most authors have no clue about how to properly do so. Word makes it easy for authors to mess up a document almost beyond belief, with inconsistent and meaningless formatting, document corruption, fouled-up footnotes, incorrect AutoCorrect “corrections,” and on and on and on. Editors are left to clean up all that stuff. Microsoft Word is expensive — $149.99 for Office Home & Student 2016 (but doesn’t include newer versions as they’re released); if you go with Office 365 Personal (which does include new versions), you’re looking at $69 per year; for Office 365 Home, $99 per year. And those years add up. Markdown is intuitive — easy to learn, read, and use. Authors can create or read Markdown documents in any text editor or word processor (even Word) on any platform — Mac, Windows, Linux, Android, iPhone, whatever, without problems of compatibility. Markdown documents can easily be converted into all kinds of properly structured and formatted documents, including Word, XML, HTML, LaTeX, and PDF — true single-source publishing. Markdown documents will be readable and usable as long as text files are readable and usable — which is to say, forever. As Markdown documents are nothing but text, they’re small, taking up very little room on a hard drive or thumb drive, and they’re easy to send by email. In fact, you can use Markdown to write email. Perhaps most important, Markdown allows authors to simply write, without worrying about formatting and other complexities, thus increasing their productivity — which is something that benefits everyone. Something easy on the eye. And you’ll see it can be done! Jack Lyon (editor@editorium.com) owns and operates the Editorium, which provides macros and information to help editors and publishers do mundane tasks quickly and efficiently. He is the author of Microsoft Word for Publishing Professionals, Wildcard Cookbook for Microsoft Word, and of Macro Cookbook for Microsoft Word. Both books will help you learn more about macros and how to use them. Thinking Fiction: What Novels Do Fiction Editors Read? In follow-up to my survey about what editors in general read for recreation (What Do Editors Read?, I invited fiction editors to share their Top 10 favorite novels, along with something about their background and experience. Thirty-two editors responded, comprising freelancers plus one cluster of staff and contract editors for a single romance publisher. No one working for a Big 5 traditional publisher participated, giving unbalanced results. However, I wasn’t attempting a rigidly scientific survey of the total editorial population. As with my first survey, I just wanted to satisfy my curiosity about what other editors read, and to share their recommendations for our collective enjoyment. The complete list, owing to length, is posted separately from this essay on the file downloads page at wordsnSync as “What Fiction Editors Read: List of Titles”. Note that not every responding editor answered every question in the survey; or sometimes they combined answers, or gave more or fewer titles when I asked for ten, and so forth. Thus in this essay I cannot always give “X out of 32” results for a given topic. Since I was looking for patterns rather than conducting a true statistical analysis, I took the liberty of rounding numbers up or down or otherwise generalizing in cases where deviations occurred. It comes as no surprise to learn that fiction editors read a lot of fiction. What is surprising is how many novels they find time to read. While one editor reports only reading fiction for work, the rest read anywhere from two to sixty (!) novels per month for recreation. Most of them also read short fiction, poetry, blogs, magazines, news media, and nonfiction of all types. Such heavy reading is somewhat understandable, in that almost half the responders work part time. For them, as with the two retirees, more opportunity for leisure reading is theoretically available. But we can’t draw a blanket conclusion from that, because in several cases the responders edit part time and do something else for the balance of full-time employment—and of course they have the obligations and complexities of a personal life (details of which were not addressed in the survey). The survey asked broad questions about occupation, education, writing background, and reading habits, to see what other commonalities might exist. The primary criterion for participation was that at least two-thirds of their professional editing work be fiction. In this everyone qualified. There were no other 100% matches, though several predominant features emerged. For instance, all but one responder is female. Three-quarters of the responders are older than forty, and of these, most are in their fifties and sixties. The full age span is twenty-eight to seventy-eight. Twenty-five responders come from the United States, five from Canada, and one each from the United Kingdom and Australia. Approximately two-thirds of the group have college degrees, of which twelve are in English or a closely related subject. Seven of the thirty-two have a certificate of some sort in editing. In years of experience, approximately half the responders have been editing professionally for ten years or less and the other half for longer. Six have more than twenty years of experience, and one has more than forty. Most have worked in fiction the bulk of their careers, focusing on novels but also accepting novellas, short stories, and flash fiction (super-short stories), along with assorted nonfiction. A majority of the responders work with indie authors as their main clients, with a few also working with publishers and packagers. All but one report that they offer multiple types of editing and associated services (the exception being a dedicated developmental editor). Twenty-six of the editors are writers themselves, and almost two-thirds of them have published. Only one-third, however, has published in fiction. As readers, the responding fiction editors like darn near everything, with literary, crime, and historical novels dominating. But many of the responding editors enjoy romance and young adult novels, as well as science fiction, fantasy, and eclectic other. The editors read in all formats, with almost two-thirds liking a mix of print, ebook, and audiobook compared to those who prefer print only. One editor has moved entirely away from print, preferring to get her stories via ebooks and audiobooks. Many of the editors favor series or complete bodies of work by a given author. These responses skewed the results, because among the total consolidated list of 263 novels, not all are unique titles but rather representative titles of a series, or just the series name, or “all works” by an individual. Ninety-four—just over one-third—of all editor responses mentioned part or all of a series. Frequently, responders listed single titles that are part of a series, but they didn’t list the entire series (the rest I uncovered during a title/author spelling check online). I suspect that in many of those cases the responder read all volumes in the series and simply didn’t say so. Specifics of series titles are shown on the complete list. Below are the series names that came up, and the number of times beyond one that they were mentioned, followed by the shorter list of favorite bodies of work by a given author. Works such as J. R. R. Tolkien’s Lord of the Rings and C. S. Lewis’s Chronicles of Narnia were sometimes listed as standalone titles and other times as series. I’ve included them under the series listing because most people who read them read all volumes. In the main, responders mentioned individual titles. The list below shows novels mentioned by two or more responders (with the number in parentheses indicating how many more than two). Individual authors were mentioned by multiple responders in conjunction with different titles. There were instances where a responder listed different titles by the same author on their own list, and also a few cases where one responder mentioned a specific title and a second responder mentioned “all works” by the same author or a series. The list below, however, only includes authors mentioned by different responders, specifying different titles. Not every responder understood the directions in the questionnaire, or else rushed through it and missed a request. For instance, I asked exclusively for novels, but two responders included memoirs and one included a nonfiction title. Although I’ve included these titles on the complete list, I do not include them in the full count. Likewise, the request for “your favorite novelist” was commonly ignored, or people just couldn’t answer because they had so many (with one responder saying, “You’re kidding, right?”). Among those who did answer, or listed multiple authors, there was erratic correlation between favorite authors and those on the individual’s Top 10 list. Favorite authors mentioned are shown below (with the number in parentheses indicating how many times more than once their names came up). Putting it all together, I observed three superstars—Jane Austen, J. R. R. Tolkien, and C. S. Lewis—whose names came up multiple times no matter what criterion I used to view and sort the reading lists of the fiction and nonfiction editors I surveyed, separately or combined. Another standout was Terry Pratchett, whose enormous Discworld series appealed to editors of both types. While I was not surprised to see these and many other familiar names on so many people’s lists, I was surprised to see who didn’t appear. Agatha Christie, for example. She is considered one of — if not the — top-selling novelists of all time, yet none of the fiction responders in my survey mentioned her. She did, however, appear once on the nonfiction editors’ list (also on my own list, which was appended to that essay but not counted in the results). Among the fiction editors, there seems to be a gap between classic and contemporary works that leaves many vintage mega-sellers behind, such as Louis L’Amour and Zane Grey, Jackie Collins and Barbara Cartland, Harold Robbins and Sidney Sheldon, Georges Simenon and Erle Stanley Gardner, and many others, all of whom were hugely popular in their day. Also notably absent is household name Stephen King (who did, unexpectedly, appear on one nonfiction editor’s literary-biased list). But J. K. Rowling of Harry Potter fame had a strong presence, even though that series was marketed for young adults, whereas Danielle Steele, still writing prolifically with an enormous fan base, wasn’t mentioned even by the editors who gobble up romance and women’s fiction. What I found to be significant among all the editors surveyed was how widely their tastes range. See for yourself the complete fiction editors list here: “What Fiction Editors Read: List of Titles”. Postscript: Apparently I’m not the only one doing this type of survey. For a literary take, see “The Most Important Books of the Last Twenty Years”. A handful of titles and authors on this list overlap both my surveys. I am certain that hundreds, if not thousands, of articles, books, and blog essays have been written to advise authors how to find the perfect editor. Even so, authors continue to ask about finding a good editor, especially if they have already had a bad experience, which tells me that the question of how to find the right editor remains unanswered. There are several recurring problems. The first is that the searching author rarely knows what she wants or needs from an editor and so uses terms like “proofing,” “proofreading,” “light editing,” and “copyediting” with the expectation that the editor’s understanding will equate with the author’s meaning. The two rarely meet. Rather than using terms like those, it would serve the author better to make a plain-English list of exactly what she wants an editor to do with her manuscript. As detailed a list as possible serves best. When the author gives that list to the editor, they can have a meaningful conversation. The second problem is deciding how much to pay for editing. Before searching for an editor, the author should decide on a budget. The budget should not be based on going rates or what the author thinks the editor’s services should be worth. The budget should be the maximum amount that the author is willing to spend on editorial help — a number calculated in the same manner the author would calculate the maximum amount she is willing to spend to buy a house or a car before actually shopping for the house or car. This number should be a gross amount; for example, it should be $5,000 and not $50 per hour. The reason for the gross budget amount is that too often authors decide not to hire an editor they otherwise think is a good fit because they “feel” the cost is too high. An editor will quote a price of $50 an hour and immediately the author’s hackles rise, thinking that $50 is too much because she had budgeted for $20. Sometimes it is better to pay more per hour for fewer hours of work than to pay less per hour for more hours of work. Better editors, as with many things in life, also tend to be more experienced and efficient; thus the higher per-hour fee and the fewer hours needed. Having set a gross budget limit moves the focus of the discussion from the per-hour rate to whether what is wanted can be done within the budget. A third problem is that authors tend to use the wrong criteria to evaluate an editor. It is true that an author should carefully evaluate an editor, but not by applying criteria that do little to answer the questions of competence and fit. Great editors do not have to be authors themselves, by which I mean writers of books or published in magazines or journals. But in today’s competitive internet world, the editor should be a blogger and a participant in public editorial forums. If I were looking for an editor, I would begin my search at a place like LinkedIn. Not because LinkedIn is such a great website, but because it provides an opportunity to get a first look at a pool of editors — those who participate in the various editing and writing groups. The first information I would be looking for is the kinds of questions they ask and answers they give in editorial/writing-oriented groups. Editors whose contributions to LinkedIn conversations consist of “Joe is right,” or whose responses tend not to address where the conversation is currently, or whose answers are often not answers, just a lot of smoke, are editors I would avoid. I also would avoid those who need help with fundamentals such as the reasonableness of some request made by a client or what to charge (or what others are charging; while I would avoid someone who asks what is the going rate, I would consider someone who doesn’t want to know what others are charging but how to calculate what she should be charging). I would not want my book to be an editor’s learning experience at my expense. The editors I would want to consider ask and discuss more “advanced” things, such as questions of ethics, grammar, underlying principles of editing, both as a business and as a craft, and the like. I want an editor who sees more than the surface of my manuscript. Every competent editor can find and correct misspellings or can understand what an orange is, but not every editor can grasp that a word has been deliberately misspelled or that what you really mean, based on the context, is not orange but tangelo. Editors give clues about themselves in the questions they ask and in the responses they write. One can determine with some accuracy an editor’s experience with certain areas of subject matter through their questions and answers. Questions, answers, and blog essays give an insight into an editor’s approach to business — and editing is a business. Note that I haven’t mentioned scrutinizing the editor’s website. The problem with using a website to form an opinion about an editor is that it is difficult to know who is responsible for the website’s content and design. I understand that the editor is ultimately responsible, but authors looking for an editor are looking for editorial skills, not for design skills, which is what the focus on a website is — design, not editing. One of the best editors I know has one of the worst websites to be found short of what pops up with a Not Found error from your ISP. A fourth problem is that authors too often rely on recommendations — positive or negative —from fellow authors. The smart author avoids hiring or not hiring an editor solely because someone she knows recommended or dissed the editor. If the editor was recommended, the editor should be put on the author’s list of editors to check out. If the editor was dissed, the author needs to ask questions designed to elicit more in-depth detail about why the editor was dissed. It makes a difference, for example, if the dissing is the result of such things as these: editor incompetence; unreasonable author expectations that the editor did not, perhaps could not, fulfill; or a personality conflict between author and editor. Depending on the reason (e.g., personality conflict), the author might add the editor to her list. After all, each author is an individual and has different needs. Different authors have different personalities — some are easier to work with and some harder. Every author needs to find the editor with whom she can work successfully — even if that editor was fired by another author. The key, I think, to an author’s finding the right-fit high-quality editor lies with the first-mentioned items: seeing the questions and answers the editor posts on editorial/writing forums and reading the editor’s blog. It is the culling done with the help of these items that will leave standing those editors the author should further interview using the first two items discussed in this essay — a description of what the author is looking for the editor to do and keeping within a preestablished budget. Once the author enters into a dialogue with the editor, the author can learn more about the editor’s skills and background in an attempt to find the perfect editor for the manuscript at hand. Yet I offer one word of caution to authors: your budget can be a very limiting factor. Experienced, high-quality editors are in demand and rarely work on the cheap. Editing is their business, the source of their income, and thus the editor has to and does charge accordingly. If you are unrealistic in your budget, you will cripple your search for your perfect-fit high-quality editor by narrowing the pool of editors from which you can choose. This is why the discussion of money should not occur until you think you have found the editor you want. Choosing editing for editing’s sake, by which I mean hiring an editor simply so you can say your book was edited, is not a worthwhile goal. Editing by a professional, highly skilled editor will enhance your manuscript and improve its likelihood for success. In contrast, hiring an editor largely because the editor fits within your budget is unlikely to advance your goals. Budgets do not have to be unlimited but they do have to be reasonable in relation to the work required from the editor. My freelancing business has evolved over the years from all-writing to a mix of writing, editing, and proofreading, but writing is my first love and I think of myself as a writer first and foremost. Writing comes easily to me, at least most of the time. In some ways, writing is more fulfilling than editing or proofreading because it’s an act of creation. I enjoy making someone else’s writing more readable, but I love creating my own written work. Giving voice to my ideas, and to the ideas and achievements of other people, through my writing is a wonderful way to live and work. Many subscribers to An American Editor see themselves as editors or proofreaders only, but others have ventured into writing as well. Since adding writing to your business services, or just writing something for your own sake, might be on your mind, I thought I’d write about writing this month. It seems as if anyone and everyone nowadays wants to be a writer, or at least get published, although wanting to get published is nothing new. There have always been people with a yen to write who have scribbled away in their garrets or kitchens, and never been published or earned a penny for their efforts. Writing has always had a certain cachet; it’s always been an accomplishment that attracted wannabes (and I don’t mean any disrespect by that term). From what I see in social media, the writing-related publications I read, and the publishing or writing events I attend, the majority of today’s aspiring writers seem to want to write memoirs, with fiction coming in second. Some aspiring writers may not want to be professional, full-time writers and go the traditional publishing route for books or the equally traditional route of working for a publication as a staff writer. You may have a single idea, passion, or mission, or had a single “extraordinary” experience that you want to write about. You can do that, and find an audience, more easily nowadays than any time in the past. Others do want to write for newspapers or magazines, but have no training or experience in producing professional, publishable material. If that’s you, some basic journalism training is probably in order. There’s also a subset of this community — the businessperson who’s been persuaded that writing a book about his or her business/profession/path to success is a great way to get more sales. This is often someone with good ideas but no writing experience or skills, at least in the kind of writing that makes a good book that would attract readers (and, thus, new customers for the business). This is someone who could be a great client for a substantive or developmental editor, or for someone interested in ghostwriting. What’s different today, and it’s not always a good thing, is that almost anyone — heck, maybe anyone! — can and often does get published. It isn’t a good thing when the writing is sloppy, careless, disorganized, rife with errors, unoriginal, and otherwise of poor quality. It can be a good thing because voices that traditional publishers ignore now have ways to be heard and read. You only have to look at the hundreds, if not thousands, of blogs; the many self-published authors and businesses catering to them; and the people who seek advice about getting published to realize that the desire to write for publication is strong and flourishing, regardless of the quality being produced. So what do you do if you want to be a writer? If you’re a successful, skilled editor, you already have a good sense of what makes a piece of writing “good,” so you’re one step ahead of many aspiring writers who have no idea of how to craft something that other people will enjoy reading. If you have something you want to say, you have a reason to write. Don’t let other people dictate what you say and how you say it (unless they’re your assigning editors, in which case, do what you’re told, but find ways to retain your voice in the process). Just write — write every day. Write what you know (although some say to write whatever you want — after all, who really knows anything about zombies, wizards, and fictional science?) And you can research professions, places, and other topics that interest you even if you’ve never experienced them. Read all the time — a variety of authors and genres. The more you read, the more you absorb the essentials of what makes something readable and the more your own writing will benefit. You’ll develop an instinct for what makes good writing to emulate and bad writing to avoid. Budget for an editor for any long forms of writing you plan to do. As everyone who subscribes to An American Editor knows (or should know), a good editor is essential for making a piece of writing its best. For encouragement, feedback, and resources, it can’t hurt to join a writers’ group; bookstores and libraries often host such groups. If there’s a literary center in your area, look into classes there; if not, see if area universities and colleges, libraries, or even continuing education programs from your local high school offer writing classes (you don’t have to undertake a degree to benefit from college or university classes). There’s something especially valuable about personal, in-person interaction with a teacher and other students that will help you hone your craft. I can’t vouch for online resources because I’ve never used them, but I have seen colleagues recommend joining online writers’ groups and taking online writing courses if you can’t find anything local or just feel more comfortable in the virtual world than the real one. It also helps to subscribe to The Writer, Writer’s Digest, and Poets & Writers magazines, all of which provide insights on the writing process and how to get published. If your goal is to write for pay for magazines, you will also want to have Writer’s Market on hand. It’s important to keep in mind is that writing is work. It’s hard work, although I’ve never found it to be the painful process that many other writers experience. For me, the hardest part is just starting a project; once I get those first few words out, it “Feels So Good,” as Chuck Mangione’s song says, and the rest tends to flow like the proverbial river. Most writing projects require research, interviewing, and organizing before you sit down and write the first few words. Part of the writing commitment is being prepared to repeatedly edit and revise your work until it’s as good as you can possibly make it. Depending on the project, you then may have to deal with being edited by someone else, which is not always easy to handle, especially if it involves rewriting. It often helps to create an outline or timeline for a piece of writing so your ideas are organized enough for readers to follow you along. That even helps you stay on track, especially with memoir and other types of nonfiction. Writing is exciting, interesting, fulfilling work, but it is work. Writing well is even harder work than writing in and of itself. You might have to spend more time on revising what you write than on producing a first draft. If readers of this blog want to become writers, I have only one suggestion: Do it. Just sit down and do it. You might not do it well, but if you are a writer, you will write. If you are a good writer, you will write well — and you will take advice and editing from colleagues who will make your work even better (many of whom you can find right here, among fellow subscribers). Get those ideas and opinions out of your head and written down. Let the need to write flow from your brain to your hands to the keyboard. Only when you actually start to do the work of writing will you find out whether you really have something to say in a way that other people will understand and respond to, and maybe even purchase. The saying that anyone has a book in them may well be true; the worlds of blogging and self-publishing certainly make it seem that way. I haven’t had the discipline or courage to test that theory yet. My book is still lurking in there somewhere, but my voice gets heard in other kinds of writing, and that’s enough for now. Today, there are thousands of outlets for your writing. Beyond the traditional publishing houses and publications, there are more online outlets than can be counted, and there’s always the option of creating your own outlet. Some outlets have stringent submission requirements, some publish anything they receive, and your own blog or self-published book has no limits. There is no reason not to write, even if you aren’t sure that your writing is any good. Show us what you can say! Ruth E. Thaler-Carter is an award-winning freelance writer, editor, proofreader, desktop publisher, and speaker whose motto is “I can write about anything!”® She is also the owner of Communication Central, author of the Freelance Basics blog for the Society for Technical Communication, and a regular contributor to An American Editor. Congratulations to our Thinking Fiction essayist, Carolyn Haley, for winning second place in the Contemporary Novel category in the International Digital Awards (IDA) contest sponsored by Oklahoma Romance Writers of America for her novel Into the Sunrise. For those interested, the book is available at Barnes & Noble and Amazon.